SKU: Selene L750L. 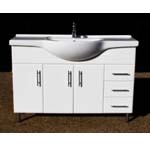 Category: 750mm Vanity Units, Semi-Recessed vanity, Vanity. 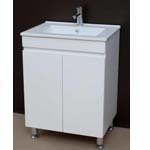 Selene L750L High gloss white polyurethane bathroom vanity unit on metal legs. 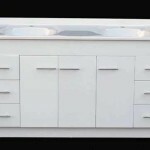 Three Left hand drawers and two solid doors with bar handles. Semi recessed ceramic basin. 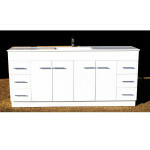 One tap hole for basin mixer (Sold separately,5 Star WELLS, Australian Std). Using overflow waste plug or pop-up waste plug.